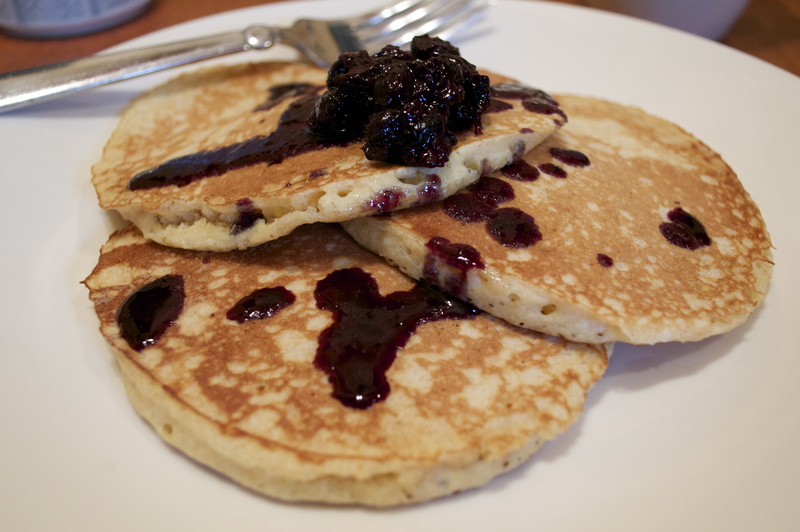 …with (not so healthy) blueberry syrup! After a long week of whole grain cereal, there’s nothing better than treating yourself to a real breakfast on the weekends. But breakfast foods (at least the ones I like) can be disappointingly unhealthy. As much as I love a Belgian waffle piled high with whipped cream and powdered sugar, it’s probably not the best way to start my day. So this Saturday I served up some satisfying lemon pancakes with blueberry syrup that hit the spot without making me feel like I had to hit the gym later. To make these light, fluffy, lemony pancakes start by whisking together the flours, sugar, baking soda, baking powder, and salt. In a separate bowl lightly beat the egg, then mix in the buttermilk, oil, honey, and lemon zest. Add the wet ingredients into the dry mix and whisk until smooth. 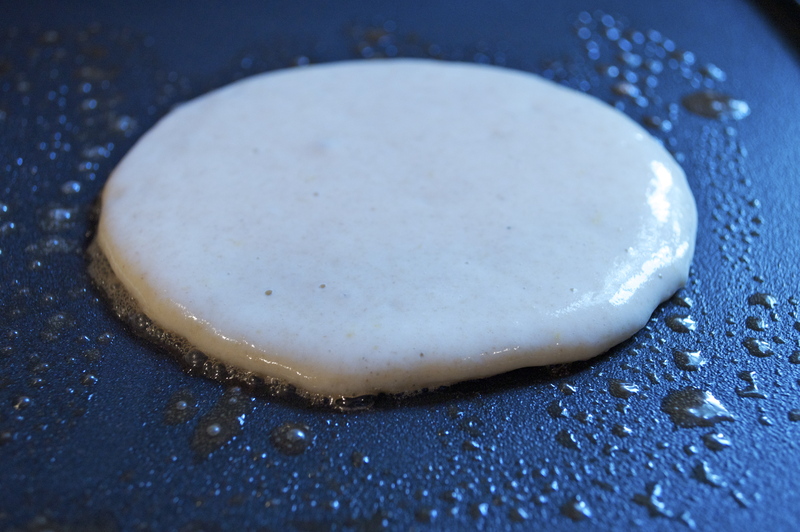 Ladle the batter onto a griddle or pan that has been greased with butter. You could use cooking spray to cut out some additional fat and calories, but for me, there’s nothing better than a little butter for cooking golden brown pancakes. Plus, you’re using such a small amount to grease the pan, it’s not like you’re on the verge of loosening another notch on your belt. Let the pancakes cook until bubbles start to form before flipping them to the other side. Once both sides are your desired shade of golden goodness, breakfast is served. Bring the blueberries and syrup to a boil in a saucepan over medium/high heat. While it’s bubbling, you can mash the blueberries with a fork or potato masher, but you can also leave them whole. After the syrup has bubbled for 2-3 minutes, remove it from heat and strain it if you’re like me and chunks of fruit freak you out. I saved the mashed blueberries to use as a garnish (or for anyone who isn’t similarly afflicted with my disdain for fruit chunks). This syrup is the perfect balance of sweet and tart to really enhance the flavor of the lemon. Pour a generous helping on top of the pancakes, and enjoy! I know I did.